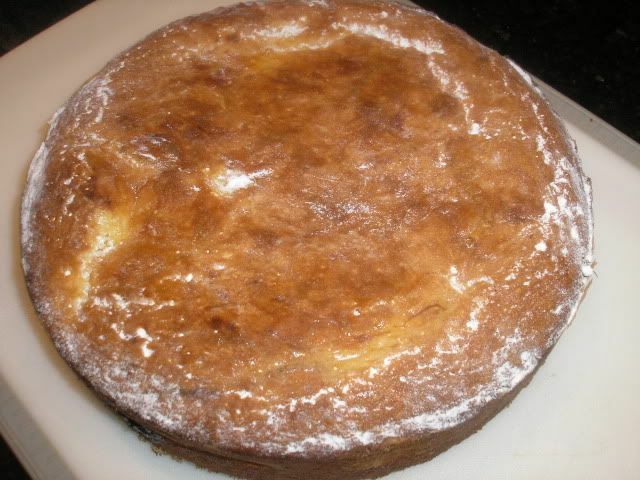 I really liked the recipe PaulOinMA posted not long ago with the herb stuffed pot roast and the dessert his wife made called Gateau Basque . I don't know how to pronounce it but it looked tasty. 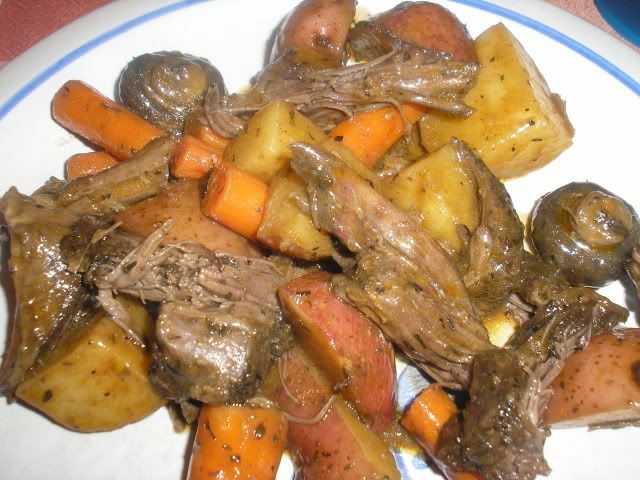 The pot roast is called Herb-stuffed Yankee Pot Roast with Root Vegetables. A 2.5 lb chuck roast. 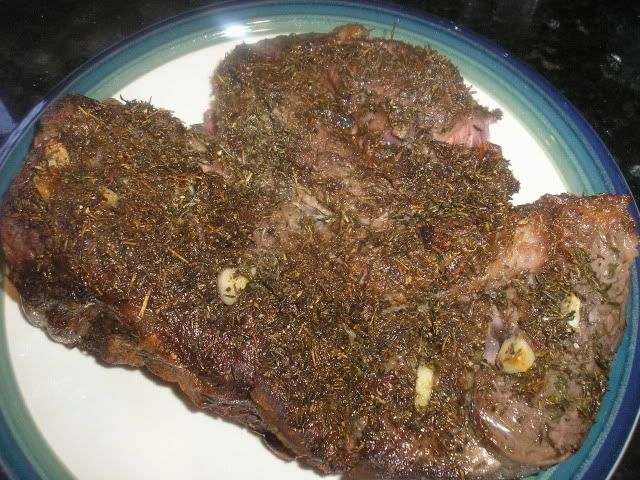 Cut one inch deep slits all over the roast and stuff it with the herb and garlic mixture. Then seared in the DO. Seared the roast in Big Momma the big 10 Wagner. Got some veggies ready after searing the roast. The kitchen is smelling right! After adding the beef stock. Roast back in and ready for the oven. The cake cooling after coming out of the oven. Second wave of veggies ready to go in! Pulled the roast out to drain the original veggies out. Original veggies drained keeping the sauce to go back in the pot with the roast, taters, carrots, and shrooms. You gotta love a recipe that has you throw away the celery....hate the stuff. Back in the oven for another hour. After I put Big Momma back in the oven I realized the shrooms were suppose to go in the last 10 mins ...oh well. Cake cooled ready to be eaten! Roast pulled and mixed with the veggies. Simmering the sauce for a couple mins to pour over the veggies and roast. Man it smells so good. Plated. Man oh man was the flavor outstanding. The family loved it too even the girls. The cake I can't pronouce was a huge hit and added to the keeper list. Huge hit! Great meal I would encourage everyone to give these two recipes a go. The original recipe had turnips included. 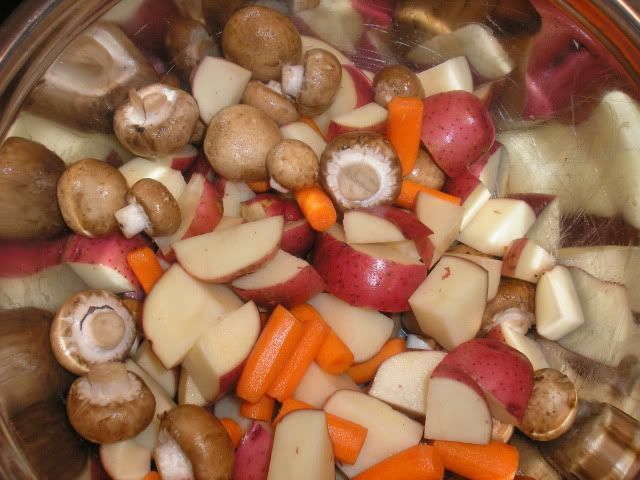 I cut those out and added more carrots and taters. It also had some wine I cut it too and added more beef broth. I like the wine taste but no one else in the family does. Trim exterior fat from roast. Using kitchen twine, tie roast around its circumference. Combine Thyme, garlic, 1 tsp. 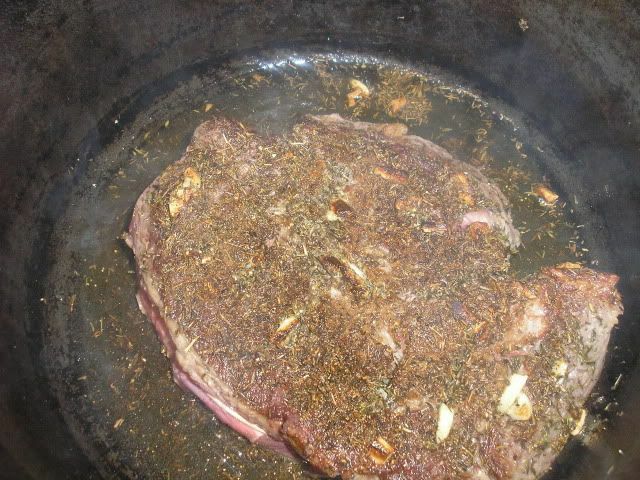 salt, and 1/2 tsp pepper. Pat meat dry. Cut 1 inch deep slits into the meat with a paring knife; stuff with thyme mixture. Season roast well on both sides with salt and pepper. 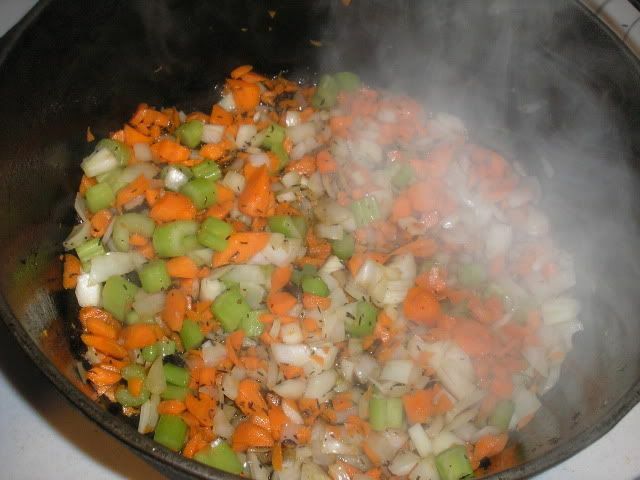 Saute onions, celery, and died carrots in the pan drippings, stirring often, until onions start to soften, about 5 minutes. Add tomato paste; stir until it starts to brown on bottom of the pot. Stir in flour. Deglaze the pot with broth, scraping up any browned bits. Stir in broth; bring liquid to boil return seared roast to the pot. Cover pot, place in oven, and braise for 2 hours. Remove pot from the oven. Transfer roast to a platter, Strain sauce, discarding the vegetables. Stir Worcestershire, Dijon mustard and bay leaf into sauce. Return sauce and roast to the pot. 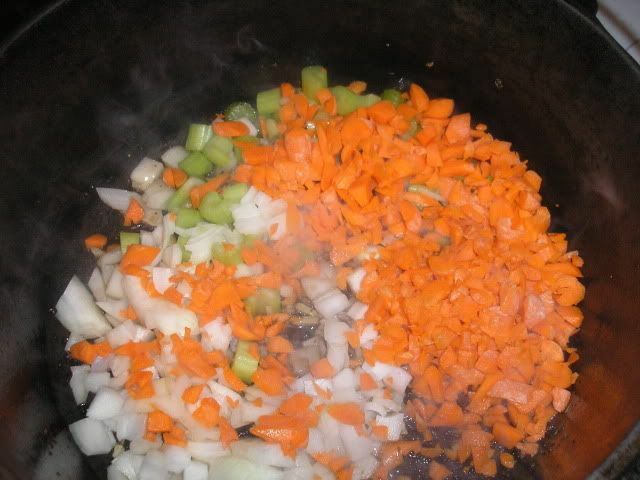 Add potatoes and carrot pieces to the pot. 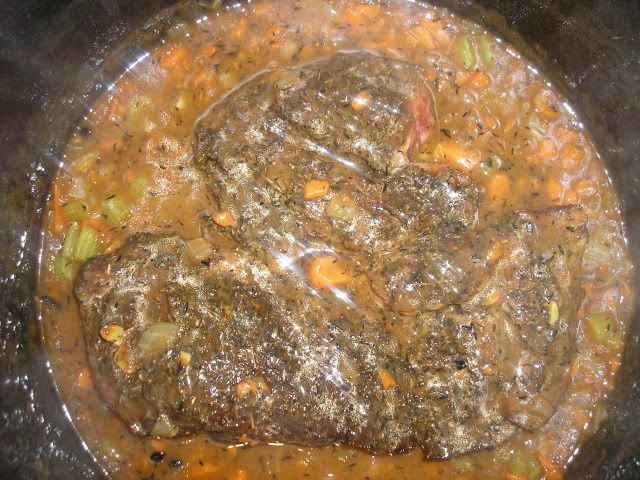 Cover the pot; return roast to the oven and cook for 1 to 1 1/2 hours, until the meat is fork tender. Add the mushrooms to the pot during the final 10 minutes of cooking. 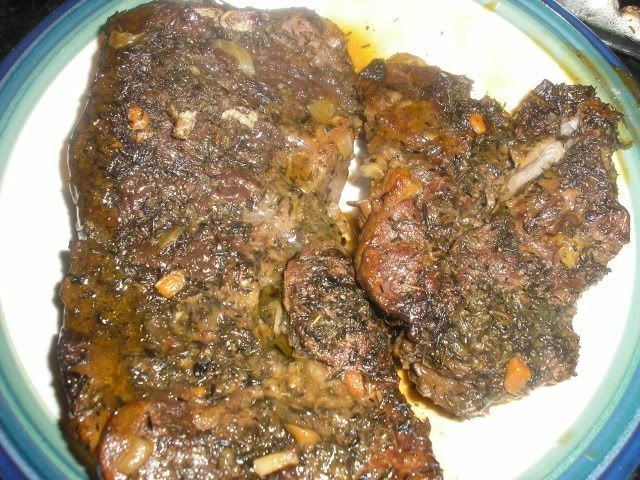 Transfer the roast and vegetables to a platter; using a fork, break meat into pieces. 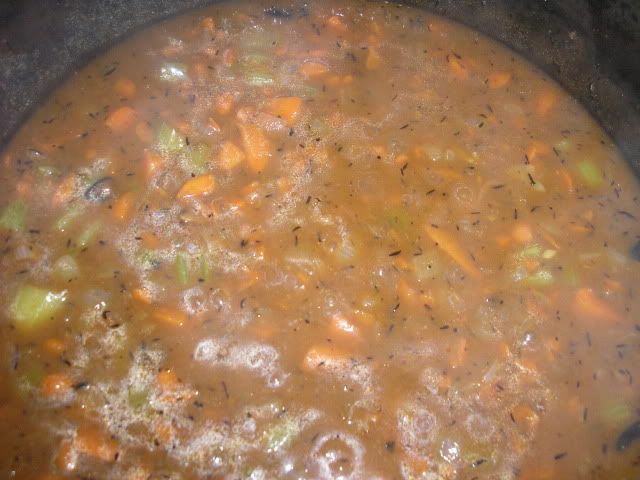 Bring sauce to a simmer; skim off and discard fat. Season sauce with salt and pepper. 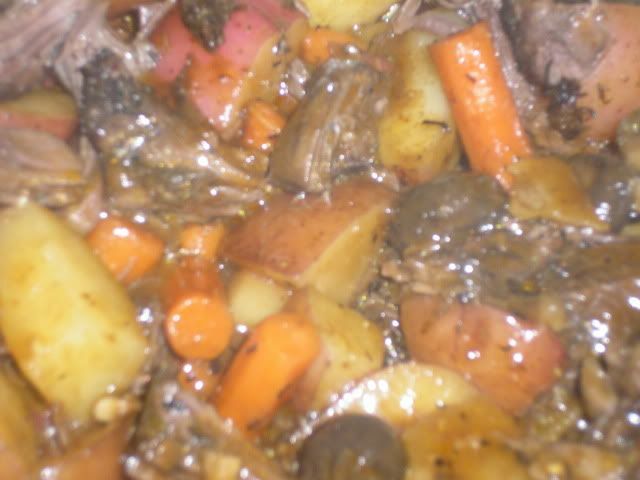 To serve, spoon sauce over pot roast and vegetables; garnish with a sprig of thyme. Total time: about 4 1/2 hours. Place the almonds in the bowl of a food processor and process until finely ground, about 45 seconds. Transfer to a medium bowl. Sift the flour, baking powder and salt over the almonds. Gently whisk until combined and set aside. Place 3 eggs and the sugar in a large bowl. Scrape the seeds from the vanilla bean into the bowl (reserve the pod for another use) and whisk the eggs until thickened and pale. Whisk in the melted butter. Whisk in the dry ingredients and rum. Let the batter stand for 20 minutes. Preheat the oven to 400� F. Butter a 9" springform pan. Dust the pan with flour, tapping out the excess. Put the pastry cream into a medium bowl and whisk it until smooth. Scrape half the cake batter into the pan and smooth the top with a spatula. Spread the cherry preserves over the batter. Fill a pastry bag fitted with a 1/2" plain tip with 1 1/3 cups of the pastry cream (reserve the rest for some other use). Pipe the pastry cream over the preserves, beginning 1/4" from the edge of the pan and piping a spiral toward the center in tight coils. Scrape the remaining cake batter over the pastry cream and smooth it into an even layer, covering the cream as much as possible. 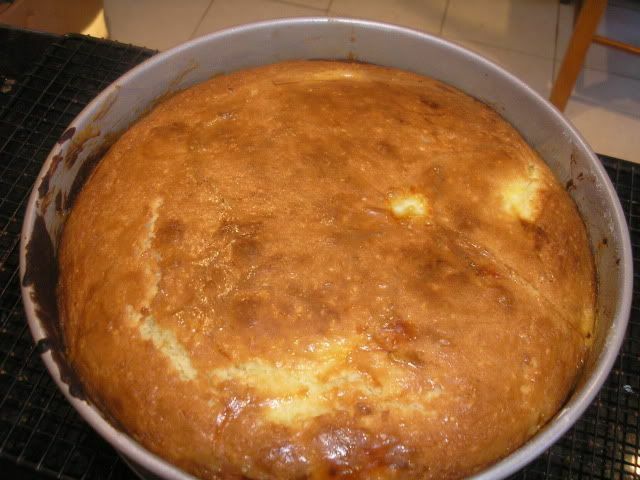 Lightly beat the remaining egg and lightly brush the tops of the cakes with the egg wash.
Bake the cake for 45 to 50 minutes, until golden brown on top and a toothpick inserted into the center comes out clean. Cool the cake in the pan on a rack for 10 minutes before unmolding and cooling completely. 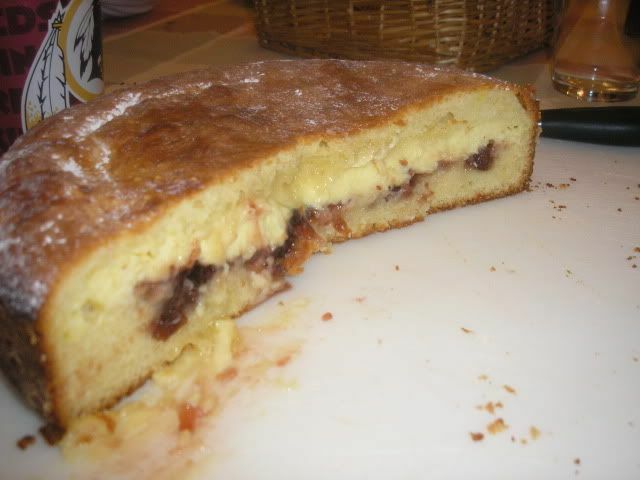 Dust the top decoratively with icing sugar, if desired. Line a shallow baking pan (such as a 9" square pan) with plastic wrap. Put the milk in a medium saucepan, scrape the seeds from the vanilla bean into the pan, and add the bean. Bring to a boil and remove from heat. Whisk together the sugar and cornstarch in a small bowl. Place the yolks in a medium bowl; whisk in the sugar mixture and whisk until the mixture turns pale yellow and is thick and smooth. Gradually pour half of the hot milk into the yolk mixture and whisk to combine. Return the mixture to the saucepan and cook over medium heat, whisking constantly, until the mixture thickens and comes to a boil. Boil for several seconds, then remove the pan from the heat and whisk in the butter until completely melted. Scrape the pastry cream into the prepared pan, spreading it evenly with a rubber spatula. Cover the pastry cream with plastic wrap, placing it directly against the surface to prevent a skin from forming. Refrigerate until needed, or up to 3 days. Remove the vanilla bean before using the pastry cream. That hunk-O-meat looked damn good before you worked that black majic on it and I think I'da ate it raw. You made all that stuff look so good that the chili Im burning for dinner, right now, dont seem so good now. But Im gonna eat it anyway. Hell of a fine job Jeepdad Im lookin forward to your future cooks...... my man. Haaaa! Thanks Hell Fire! Actually, the dessert is from Spain I just can't pronounce it! Its dang tasty though.
" A Touch of Hickory and a Taste of the Blues "
Dan, that is an awesome looking plate of goodness right there. Beautiful job on the roast and veggies, and the dessert looks fantastic. Nicely done my man. You gotta love a recipe that has you throw away the celery....hate the stuff. That dessert is a "keeper," too. 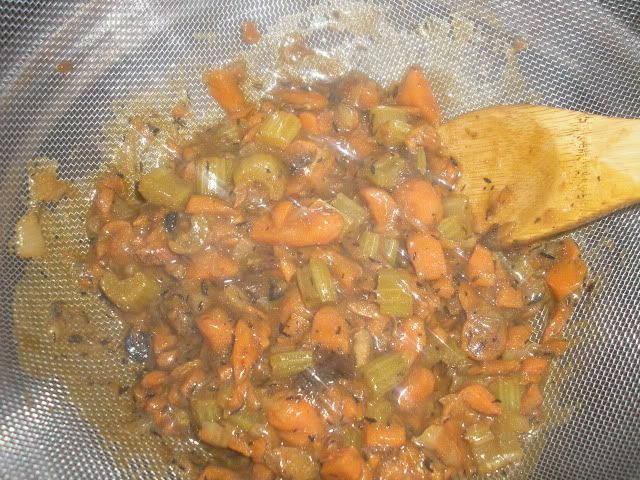 I just hate throwing away stuff, so, as I posted in the other thread, I ran the veggies through a food mill back into the sauce. We're having some people over to watch the Daytona 500. It's also one of the guys' birthday weekend. I just e-mailed him if he wants the same thing as last year (pulled pork, cornbread, roasted sweet potatoes with honey-lime glaze, cheesy corn bake, macaroni and cheese, and birthday cake) or pot roast. Jeepdad ... please let me know that your received my e-mail. It's the first e-mail I sent in here, and I want to make sure it went through. Gat (like the 30's gun reference) Oh! (common exclamation) Bask (like the seals lounging in the sun). Each of these will give you the button for the sound! BluzQue, thanks for the kind words Bro! Thanks Brinnie it is appreciated. I liked your lamb stew a lot! Thanks k.a.m., I'll trade you a bowl for a bowl of your shrimp, okra and sausage gumbo! PaulOinMA, Ha! Sound slike a great time and great chow! Yes, i got the email thanks! Thanks SoEzzy, that is way cool and interesting. I really do like knowing how to pronounce what I'm cooking! That is perfect winter comfort food right there jeepdad! VERY nicely done (as usual)! 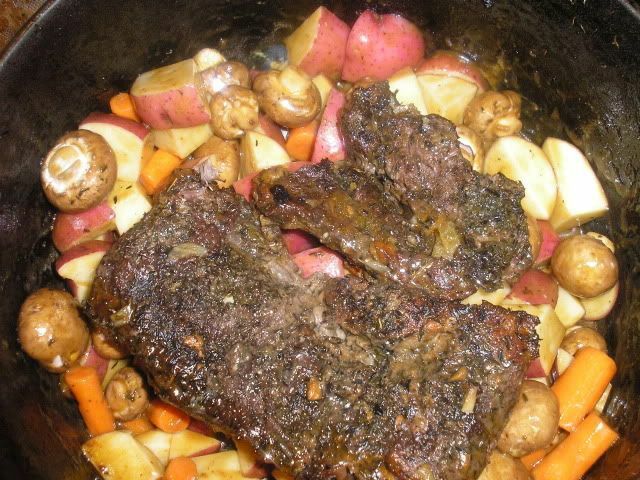 Made the pot roast again yesterday. Great recipe. Instinctively turned off the oven when I removed the Dutch oven from the oven to run the sauce through a food mill and add the vegetables. I was at why the potatoes weren't softening. Dinner was a bit later than desired. nice post ,thanks for sharing the recipes. needed this. Thanks for the inspiration. Time to get the iron out. I made the Ghetto Bake cake over the weekend and everyone loved it. Price Chopper, my local supermarket, had roasts on sale for $2.99/lb. And, if you bought a roast, a coupon for 5-lb. potatoes, 2-lb. onions, and 2-lb. carrots.